to give you my honest opinions about the entire delicious process. There's something about fall that makes me want to cook and bake. Not just anything, mind you, but foods that make me think of home and family. When I found this recipe on the Red Star Yeast website, I knew it met the requirements. A rustic, no-knead loaf baked in an iron skillet (or casserole dish!) is perfect for this time of year. If you've been a little hesitant about making homemade yeast bread, this one's a great recipe to start with. Just put a few ingredients together, let it rise while you do other things, plop it (technical baking term) into a skillet or dish, and bake. Even if you're an experienced bread baker, you'll enjoy the unique and easy preparation, and your family will love the homemade flavor. Rustic Oatmeal Casserole Bread is slightly sweet, thanks to a touch of molasses, and oatmeal gives it a nice, chewy texture. It's one of my new favorite recipes, and it comes with a bonus: your whole house smells divine. Go over to Red Star Yeast and get the recipe for this bread. I added one thing to the recipe: right before I put the bread into the oven to bake, I brushed it lightly with an egg white mixed with a teaspoon of water, then sprinkled the bread with a pinch or two of uncooked oats. This step is completely optional- I just like the way it looks. Please visit Red Star Yeast for the complete recipe for Oatmeal Casserole Bread, detailed instructions, and handy baking tips. I am so hungry now! 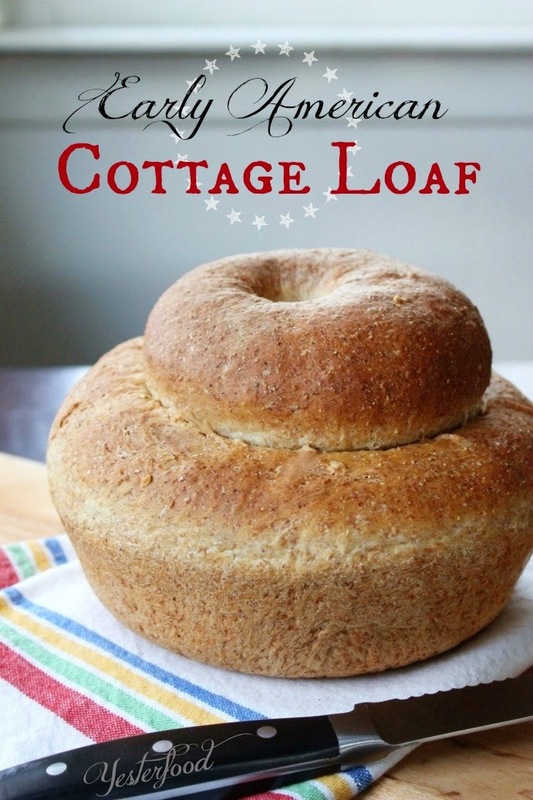 I love oatmeal bread, and this recipe is one I can't wait to give a try! Mmm ... this looks delicious! I love that it's cooked in a cast iron skillet! What a beautiful bread! Anything baked in a skillet is better in my book. And I love your presentation with the oats on top. Pinning! That bread looks so delicious -- I'm craving a slice of it toasted and topped with apple butter. Yum! Your bread turned out picture perfect. It is truly beautiful. I love that you baked it in your cast iron skillet/dutch oven. I have not seen a deep cast iron skillet like that. I love it too. You have inspired me to bake some bread. This recipe looks great! I love bread, especially with strawberry jam. This bread looks so healthy, so filling and just plain comforting! Perfect for this time of year! And I love how it doesn't "need to be kneaded!" Yay! This bread looks absolutely fantastic!! This looks like one to try! Glad I saw it at the Turn it Up Tuesday Linkup! What a beautiful loaf of bread, Joy! I think that I might have to give this one a try! Looks delicious. Pinned and tweeted! That is a beautiful loaf! I love the addition of oats over the top - looks so tasty. What a beauty. I must try this. That looks amazing ~ can't wait to make this during the holiday season! Your recipe looks so good, I have not made bread in years, but this looks so easy!!! Thanks for sharing on Oh My Heartsie Girl, have a great weekend!!! This bread sounds so easy Joy and looks so delicious! Will be giving it a try! Thanks for sharing it with SYC. Red Star yeast and King Arthur flour - my bread making standards for 20+ years. It is supposed to get quite chilly next week end = perfect time for some baking - will be checking this out for sure. Happy SYC! Must. Make. Immediately! That looks so tasty :) Love that it's baked in cast iron. I'll have to check out Red Star yeast! What a beautiful loaf of bread, it looks delicious. Thanks so much for sharing with Full Plate Thursday and hope you stay warm and cozy on this cold day. Mmm. This look fantastic! Pinning! Thanks for linking up at Show Me Saturday. Hope to see you there again this week! This bread looks fantastic and the recipe sounds like I could actually pull this off! Thanks for sharing with Creative Spark Link Party. I've only ever made bread in a bread maker. You've convinced me to give this rustic oatmeal bread a try. Congrats, you're featured this week at the Inspire Us Thursday Link Party on Organized 31. Joy, I love this recipe and that is made in a cast-iron pan.. Thanks for sharing this at Foodie Friends Friday and to let you know that this is my host favorite. It was featured over at the Daily Dish Magazine and on my blog at this week's party. I hope that you will join us again this week. This reminds me of the bread from Cheesecake Factory. Looks amazing!!! Hi, Joy. I love baking with oats. The combination of oats and molasses sounds really good. I've picked your bread to feature at tonight's party. Thanks for linking! This recipe looks so easy, your loaf turned out beautifully!!! Stopping by from Barbs blog to also invite you to join in Merry Monday Linkup. Hope you have a great week!! Congratulations! Your post is being featured at this week's Motivation Monday party!